Glad to be back after such a long time away from the blog! Today I'm here as part of the Creativation Blog Hop! Each designer is sharing one of their show samples and if that is not good enough, we have prizes to give away to some lucky winners! Leave a comment on as many blogs as you wish - the more you comment, the better your chances at winning a great prize! Comments must be posted by midnight PST on Tuesday, February 6th. Winners will be announced on Wednesday, February 7th on Richele's blog. The project I am sharing today was in the idea-ology booth. I created a wall piece using architectural moulding (10 x 5.5") as the foundation. The moulding piece I used is called a Bullseye Plinth Block (bought on Etsy) but sometimes you can find them listed under plinth rosettes, architectural salvage or even corbels. If you look closely, you can just see the edge of the "bullseye" under the Trinket Tin. I painted the inside of the tin with Weathered Wood Distress Paint. Once dry, I lightly sanded the edges to age the paint. I added a piece of an vintage envelope to the door with Collage Medium (including a layer over the top to seal it). Once it was dry, I scribbled Walnut Stain Distress Crayon over the top and used a damp brush to wash over the surface. You really needed a brush to do this part so you can get the crayon color all the way out to the edges. I cut foam core to fit inside the deep tin to bring the inside forward. Then layered linen from the Textile Surfaces Pack and a piece from the new Worn Wallpaper pack over the top. A Photobooth image and a Clippings sticker was added to tell the story. At the bottom of the piece there is sizable indentation in the moulding that was just screaming for a stick. I wrapped the end of the stick with dyed cheesecloth and a bit of lace, binding it with dyed cotton string. The added Story Stick is one of my favorite and most used of all the new metals. Small, concise (and with a faux eyelet)... it is the perfect added detail on any piece (note to self: must buy in bulk). The metal piece at the top comes from the new Foundry pack. The metal has been aged with paint, alcohol ink and crayon. Two Mini Fasteners were added to appear as if the plate is actually riveted to the wood (but of course it's not). The button card on the front of the tin is vintage. The added Quote Token is not, even thought it appears to be. A mix of Distress Paint, Picket Fence Distress Crayon and Alcohol Ink make for the perfect patina. Well I hope you like this piece. I LOVE mixing vintage and new (made to look old of course). The Trinket Tin is the perfect little box to hide found treasures and tell secret stories. I see these being used over and over again! Vicki is next next up on the Blog Hop so click on the link above to pop over her to her blog and see what she is sharing today! A huge shout out to Richele for organizing the Blog Hop! Thank you Richele! First blog hop comment and am totally in awe of your inspirational tin! This piece is gorgeous. I Love the salvaged wood background. It adds such a beautiful detail. The tin and metal pieces are aged to perfection. I would love to see a video of how exactly you do that. I too love hiding little vignettes inside doors. IT just adds so much character to a piece. Wonderful project Paula! It would be hard for me to use my vintage findings as I tend to hoard them...Great mixture of old and new. Love it! Oh My!!!! This is simply scrumptious, fabulous, divine! I LOVE it!!!! It's crusty and grungy in all of the good ways! Your work is always so beautiful. Details, details, details- you're the queen. OH MY WORD I absolutely love this... don't know where my comment went ( hehehe) that will teach me to get that giddy ! This is gorgeous Girlfriend. OMG stick detail at the bottom ( that blew me away) you KNOW how I love detail... okay I'll stop drooling now ... gotta wipe off the keyboard before I go to Vicki ! Genius using the moulding as a base. The way you combine the old and new is truly masterful. The indentation...”screaming for a stick” comment made me chuckle. Thank you! I love the quote tokens and how you always push the boundaries of substrates. Gorgeous! stunning...your attention to detail. mix of vintage and 'aged' new items is amazing and inspiring! thank you!!! Love using the plinth block! I’ve had one for years but never ‘used’ it! I love your use of the vintage architecture piece, and the story within the tin is fabulous. Beautifully done as always! LOVE this project so much with the combo of vintage goodness and new Idea-ology pieces it's perfection! The tiniest details are amazing! Thank you for sharing your beautiful project on the Blog Hop! I always enjoy your "art" Paula, you really do pieces that I love. This one is great and love the tin with the photo. I would love to make something like it with my grandparents photo inside. Way too cool for school! ;) Have a great weekend. I love this idea as a way to show us all the inspiration pieces from Creativation. You always make me wonder if I have something tucked away that could be given new life. Thanks for creating such beautiful pieces and sharing! Always amazing work Paula.....Steller project. WOW this is amazing! I love the design and wonderful textures. Love it-what a fantastic display piece. I just love those trinket boxes. I always love seeing what you create, there are so many wonderful details, loving those sweet buttons and the little tag! Spectacular. I have wanted to see what you did with the little tin ever since Tim talked about it in the Idea-ology demo. It is a great piece. Thank you for sharing the details. Oh, and the moulding as the background is inspired and perfect for your art. Love this! Great use of moulding. What a fantastic piece! I love the Idea-ology quotes! Thank you for sharing! I love your mixed media piece. This is stunning! Great idea! It's amazing work! You have some very cool ideas! I always love seeing the projects you create Paula! This is another winner. I really love the inclusion of the vintage envelope inside the tin lid - such a great idea. I have a punch of tins that now will have a purpose. Thanks! This is such a gorgeous piece. The little tin is beautiful. I can't wait to be able to use a few of those myself. I off to buy an altoid tin! Oh those white buttons I picked up at a flea in Paris will finally get used! Excellent work! The tin looks so good, great use of the postcard-style clipping inside the front cover! Wow Paula, that is an amazing piece. Love the mix of the old with the new idea-ology pieces, but they go together perfectly. You are the queen of grunge. WoW! 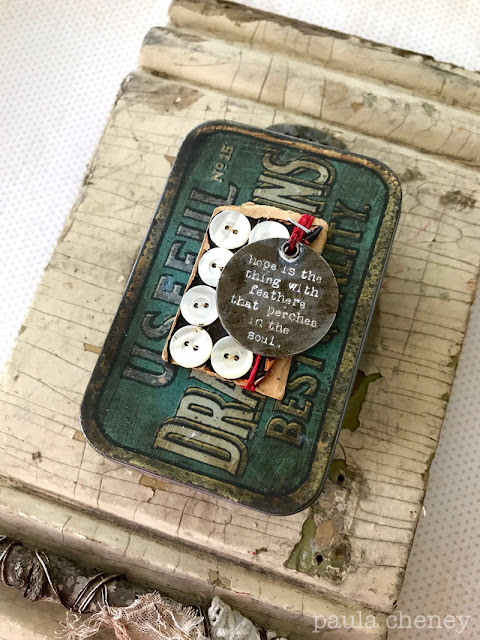 I have tried aging altoid tins but I will try your technique for I just loved how this project turned out! Thx Paula! Awesome inspiration! Great show of the new products. So cool! You have a great eye for constructing magic! The tin is my favorite part of your project. Beautiful work! Love this! Every little detail of it. Can't wait to try a project like this myself! This is fabulous! I absolutely love the piece that you used as a substrate- so very clever and original!!Love! LOVE LOVE LOVE this Paula! Using the piece as the substrate, and then the tin on top...LOVE!!! So gorgeous...all your projects this year rock!!! Love the use of the bullseye plinth to bring your project to life! Love the aged look it has got, especially the stick and the little ‘story’ stuck there. seriously you kill me !!! I absolutely love this.. how it is aged, and put together and mounted ... brilliant as always... more talent in your little finger than I can even imagine!! thanks so much for a chance to win!! Love the upcycling in this piece. This is amazing, all the little details, the buttons, little tag, the torn envelope inside. Really great job! Huge congratulations to you and the whole team on an amazing Creativation - the booths looked incredible (I'm only just catching up due to a crazy January)... I just love the weathered panel here, stunning combination of true antique and fabulous Idea-ology vintage. Breathtaking! Winner winner chicken dinner! It's all in the tiny details that make your art stand out. Thank you inspiring us. I love those tins and just didn’t know how to use them, despite the obvious. Thanks for the inspiration! I feel so thrilled that I got to see the Booth in real life (and meet you! ), to enjoy all the amazing samples, including this stunning piece Paula. 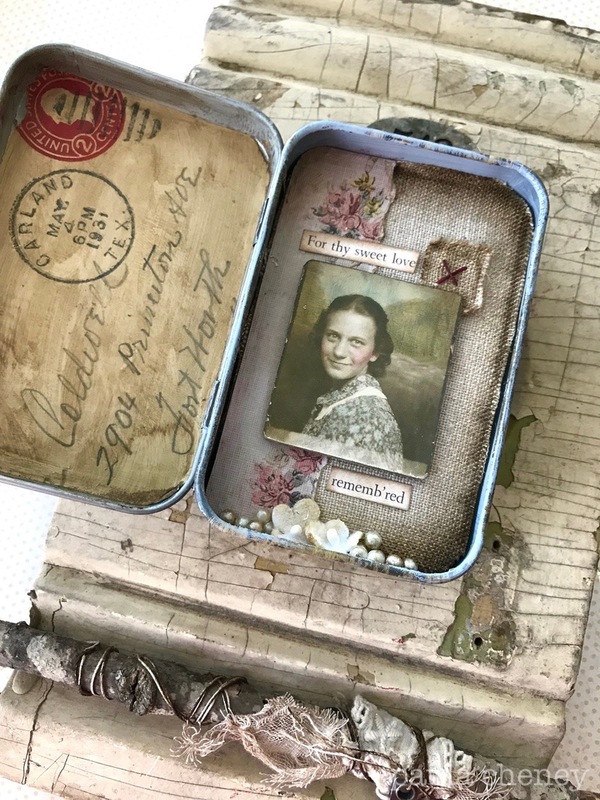 I love how you decorated the tin including the vintage and the new - stunning work! Paula - that base foundation piece is amazing and I love the use of the tin. When I first saw them I wasn't sure how it could be used but this is just perfect and has given me a few ideas...now I just need to place my very large order of lots of new items! Thanks always for your creativity! Ohhhhhhhhhhh, Paula... this is absolutely awesome. I love it all - start to finish, top to bottom. You turned it all into something magical. Thank you for sharing! Beautiful! Love the use of architectural salvage in your piece. Your designs are always so darn incredible! Without a doubt this is a work of art. I love all the elements. You've done an amazing job using the trinket tin and all of the metal Ideaology. I adore the vintage feminine interior juxtaposed with the rough, weathered exterior. 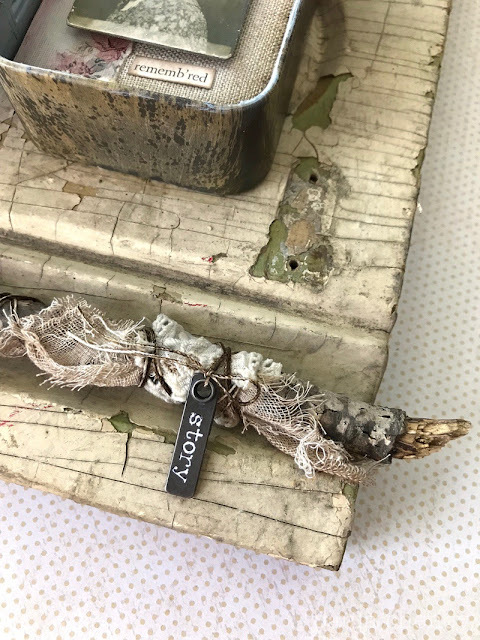 I'm thinking the same thing about the Story Sticks--they will more than likely be a staple in the craft pantry. Love this amazing piece from top to bottom! Oh Paula I adore this piece! I saw that stick in pics from the show and said “That’s one of Paula’s!” So fabulous to use the vintage molding. I would never have thought to get that online. Thanks for the tip! As always, sooooo amazing!! Please Please post all of your projects from the show--share with us your incredible gift!! So, so amazing Paula. I love how you make things "vintage". Such a great piece!! Love it. Vintage, old and chippy...so cool. Stunning!! Love all of the visual texture!! Such imagination. All the details are so wonderful! What a great idea. Thank you for sharing! Love how the indentation was "screaming for a stick"! And even though I've watched your and Tim's idea-ology video repeatedly it's amazing how much detail you miss until you see close up pictures! Love the word sticks - I think they may end up being one of my favs from this release! BTW ... loving the blog hop! Oh Lord....trinket box art. A gotta have, gotta get! Paula you know I'm a sucker for boxes of any sort after seeing what you do to them. Thanks for the tut and techniques! I love your use of the tin! Adding vintage ephemera to the project makes it so very interesting! Thank you for sharing your talent. This is so cool! I love the vintage/shabbiness it has! OH, how fun! Like nothing I see elsewhere! Best blog hop ever!!!!! I love this project. I have two preorders at Simon with all new stuff... can’t wait!! Beautiful project! I love mixing new and old too and make them match in vintage style. Thanks for sharing! This is totally amazing and so creative......vintage art! Love your style! Paula this piece is beyond beautiful!! You can't tell what's new and what's vintage at first glance. I love the surprise collage inside the tin. My wheels are turning now!! Thanks so much for sharing!! fabulous project with so many treasures.. How did I ever miss the Story Sticks in all the reveals. Off to order them!! Paula, You are so fabulous! I love your style so much! Who would think to add layers to the box to make it easier to see the photo? Only you. 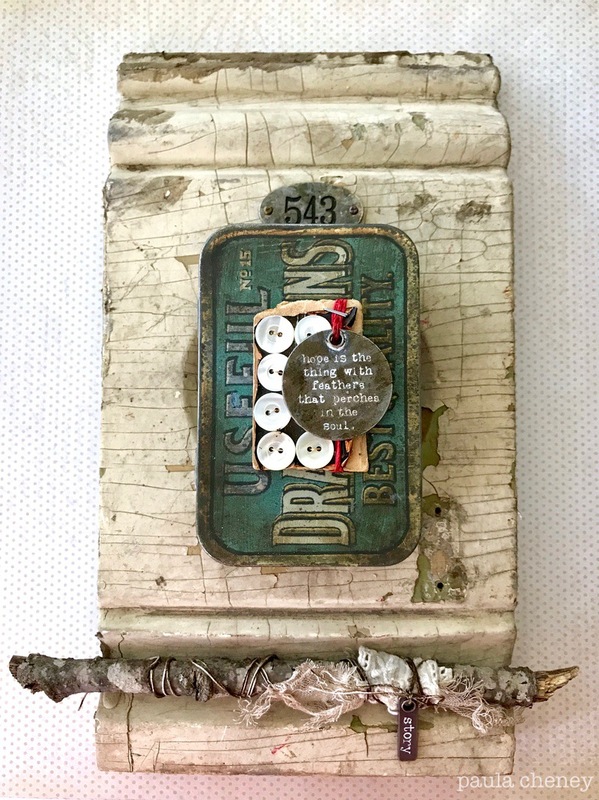 Thank you for all you do to add to the wonder that is Tim Holtz! Your style makes all his product look so good! Love that you built onto an old piece of molding. It just sets the tone for the art. I can't wait to get my hand on those tins! Thank you for the inspiration all your beautiful work gives to so many! I'm in LOVE with this project. The stick at the bottom just makes me swoon. I flip houses and have lots of leftover trims and corbels I could distress for something similar...thank you so much for the inspiration!! I can't help but love your CHA project!! I'm like you in that I love finding old stuff to use in my art. I always wonder what the story was behind them...who touched them, used them, etc. 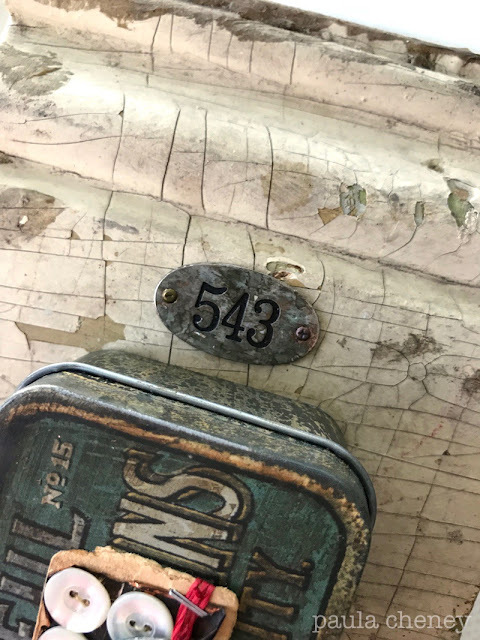 Now we have more wonderful items to add to our art thanks to Tim Holtz and inspiration thanks to you! Very cute, thanks for the inspiration! I love mixed media..thank you for the inspiration! Very unique! I love the mix of new and old. Wow this wall piece look amazing! Truly amazing...wow. Your work is absolutely gorgeous. Gorgeous piece, as always! You never fail to impress! Wow, I love always the way you combine different products, who got nothing to do with each other, to one gorgeouse piece. Thanks for all your amazing creativity! Incredible! I love the foundation piece you used. I love your use of old and new. This is clever and charming. Oh my gosh, it’s a gorgeous project. You are so creative! I love how you mixed the old and new and made it into something special. Great project! I'm a big fan of the ideology line and how you use it so creatively! I love your work! there is so much to see and learn from every little piece of this project!! thanks for sharing! Your project is AMAZING! Love all the wonderful elements! I love the Quote Token! Awesome! Love that you have such a cute surprise in the tin. Your project is beautiful! Thank you for sharing. How unique! I would never imagined such a creation! That is why you create with Tim & I don’t! LOL! So many elements & textures coming together to create something so beautiful! You are amazing! This is awesome. Thanks for the great inspiration. love the tin and how its interactive. What a fantastic project! Thank you for sharing your amazing creativity and inspiration. Great variety of layers of textures. Love the wrapped twig! A fabulous project, Paula! Love what you used as your substrate and everything about this is just too, too amazing. Love! Every time I look at this I see yet another amazing detail. Thank you for inspiring me! Really great creation. Love that each little piece kind of has a story. LOVE LOVE LOVE all the details, beautiful piece! Beautiful project! I loved when you showed this on FB Live!! Wow, such great detail in this piece! I love the story stick and faux eyelet! I love the whole thing actually! This is perfectly vintage and rustic. I love the tin on your wall hanging but especially the branch with all the lovely fabric and fibers wrapped around it. Very interesting and original work! What a cool project! I love how you used the tin. Without a doubt, this piece is amazing Paula! I love the cracked/peeling vintage architectural moulding as the base and the addition of that wrapped stick. Along with your mix of old and perfectly distressed new, is just stunning! Love the way you used the tin for your focal point on this piece. Have quite a few tins I've collected over the years so I'll be looking at them in a new light. Thanks for the inspiration. Wonderful work as always Paula! Love the mixes of old and new! WOW...When I first saw this in Tim's booth tour video I just had to have the details. Your combining antique background with aged new products is incredible! !! Amazing designs, Paula! Precious details on the tin "frame." Paula, this is perfectly gorgeous and gorgeously perfect! It is all fabulous of course but I especially love the way you've used Picket Fence distress crayon to highlight the letters on the quote tag. It offsets the dark patina effect perfectly!! I love this piece, the found objects and the fact that the tin opens to reveal more goodness! The addiction of the stick is brilliant and adds an element of surprise and uniqueness! Awesome project!! Thanks for the inspiration. Wow, I really like this tin box project, tfs. Wow! I love how you think... so outside (inside) the box. And don’t even get me started about the story stick. That’s just awesome! I like your piece; I especially like how you placed items in the tin and the story stick! Wow! Wow Paula. Love all your details!! Thanks for such great instructions so we can try some of yout ideas. Lovely as always! Hoping to see you again at The Crafty Scrapper in the spring! Be still my beating heart.... Such an inspirational piece, Paula that stole my heart as soon as I saw it on Tim's tour of the booth. Thanks for sharing and allowing us to indulge in all the amazing detail. Oh my GOODNESS, Ms. Paula!!! Inspiration AND education! I have been admiring some architectural pieces, of late, but wondering what on earth I’d do with one, if I brought a piece home. Your wonderful creation just set my thoughts in MOTION, today!!! NOW, I know EXACTLY what I’ll do, when I go back to the place where I had been rummaging through some of these very pieces...AND...knowing what they’re called, now, is VERY cool! Thank you, Paula!